SVU's Ice-T sinks his fangs into the first trailer for Dan Lantz's Bloodrunners. The notorious rapper stars as an ancient vampire hellbent on conquering a prohibition-era town. And today, as a special Halloween treat, we have your first look at the trailer, along with the first poster and new photos. Speakeasy Pictures and IMPULSE-FX have released the first trailer for the period action thriller Bloodrunners. 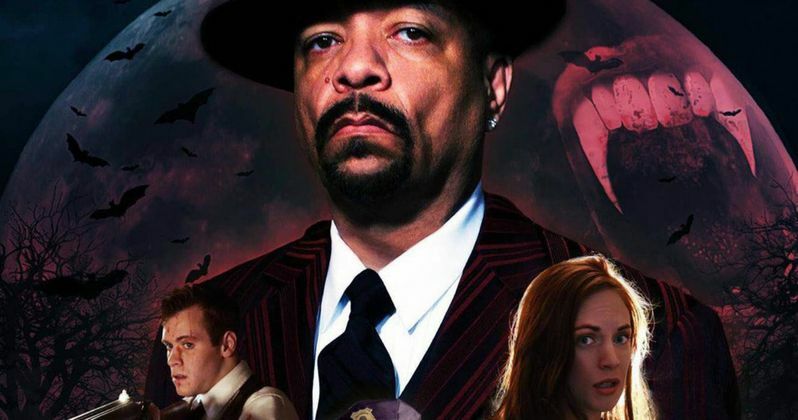 The latest feature from writer-director Dan Lantz (Blind Love, Felix Melman), Bloodrunners centers on a turf war between a crooked cop and a power-hungry vampire (Ice-T, "Law and Order: SVU") over a small town soaked in illegal hooch during the height of Prohibition. Bloodrunners combines the action of crime dramas with the otherworldly gore of vampire legends. Michael McFadden (The Networker) headlines as a cop living large on looking the other way as booze flows through his protectorate. When he discovers that Chesterfield, the owner of the latest speakeasy has a thirst for warm blood as well as cold hard cash, he must find a way to save his town before it dries up. By 1933, Prohibition has proven a booming enterprise, where average citizens break the law, hide in the shadows and operate at night. The new world order has even lined the pockets of corrupt cops like Jack Malone (McFadden). He collects a 'luxury tax' from every bootlegger and scofflaw in the small town he has sworn to protect. While shaking down the newest speakeasy in the local underground, Jack and his men uncover a clan of vampires hell bent on taking over the town. Now Chesterfield (Ice-T), an ancient vampire, and his horde must hide their secret at any cost. The bloody result leaves several bodies and innocent townsfolk taken as lambs to await the slaughter. With nowhere else to turn, Jack joins forces with a busboy and a crazy preacher to save the town and make a final stand against Chesterfield and his vampires. Bloodrunners is expected to premiere in 2017. Check out the first trailer, photos and poster courtesy of Speakeasy Pictures.